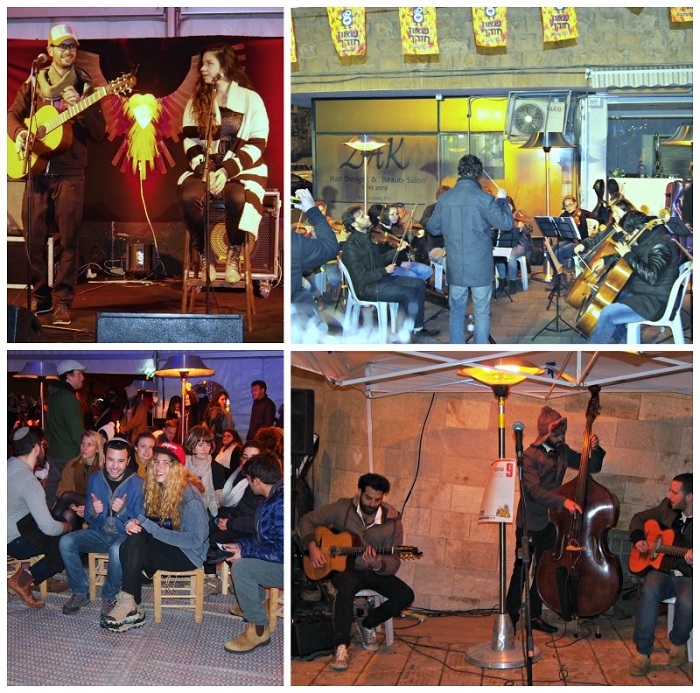 Shaon Horef (Winter Noise) is a cultural festival that takes place in Jerusalem every Monday evening during the Month of February. 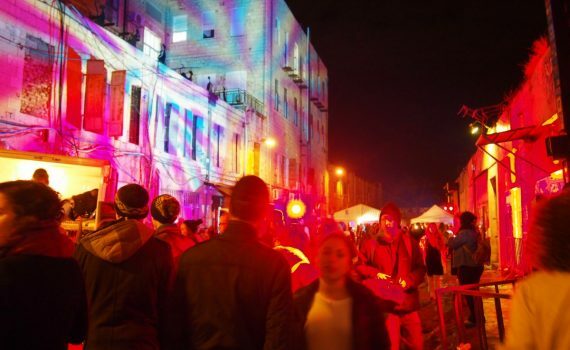 The festival hosts musical, food and arts activities, many of them outdoors, in the streets, restaurants and coffee shops. Overall, it there are 300 different activities, about 60 each Monday, in different parts of town. 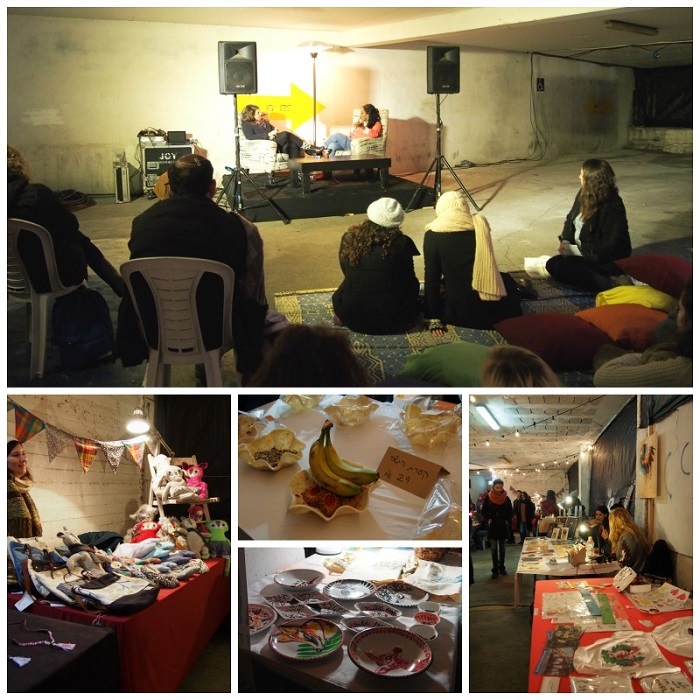 We went to Jerusalem on a cold winter night to taste the enjoy the events in one of the Mondays. While the festival was organized for the younger crowd, it is great at every age. It is the 5th year it takes place in Jerusalem. We started our evening at “Shushan” area, where Shaon Horef number 1 took place. We went to Yanai Street, where a street food party took place with culinary walk. Along the streets many food stands were placed: soup, hot dogs, sweet pizzas, beers, etc. The walk was accompanied by a street concert of a string orchestra. 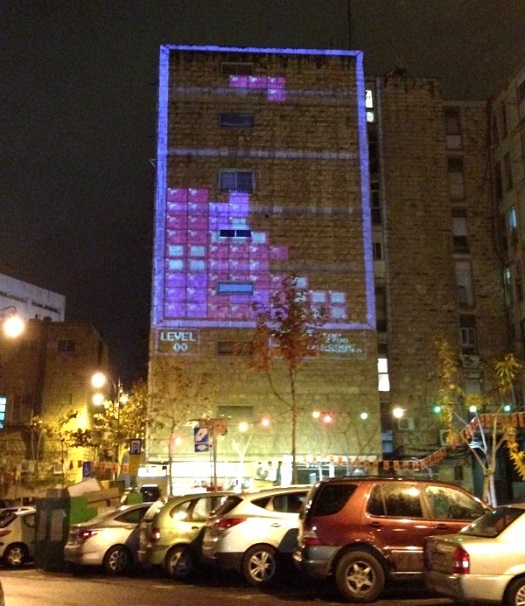 With the sounds of ‘Imagine’ by John Lennon, the crowd played Tetris on a 5 stories building! 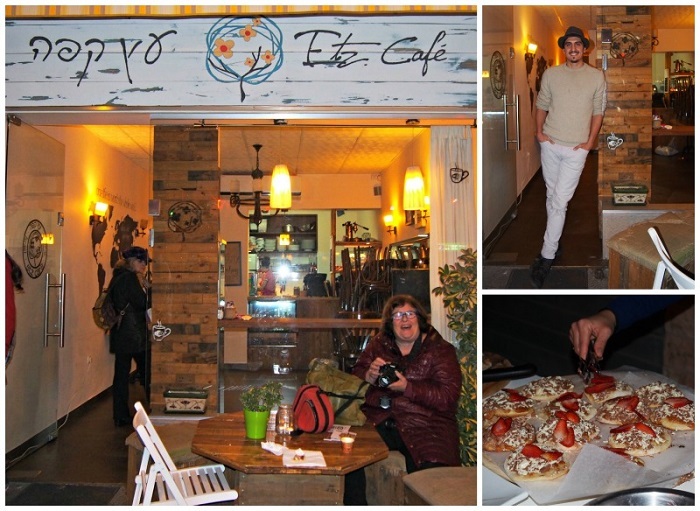 Among the restaurants and gastronomic options in Yanai street, we visited: Shraga, Reni’s deli, Etz Café, Coffee 7, and Biratenu. Shraga coffee was once a coffee shop at Baka neighborhood. 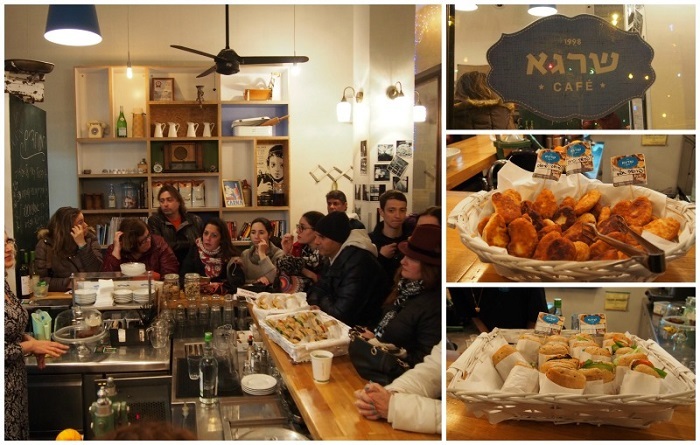 The coffee shop at Yanai was named after it, preserving the nostalgic atmosphere of that old café. The restaurant serves a variety of dishes, with many vegetarian and vegan plates, and soups. I tried their potato Piroshky (a Russian traditional stuffed pie), delicious. Nearby, Reni’s deli opened a beer and hot-dogs stand for Shaon Horef festival. The deli that is open 7 days a week, is not kosher. You will find there a large collection of deli foods and cooking supplies. 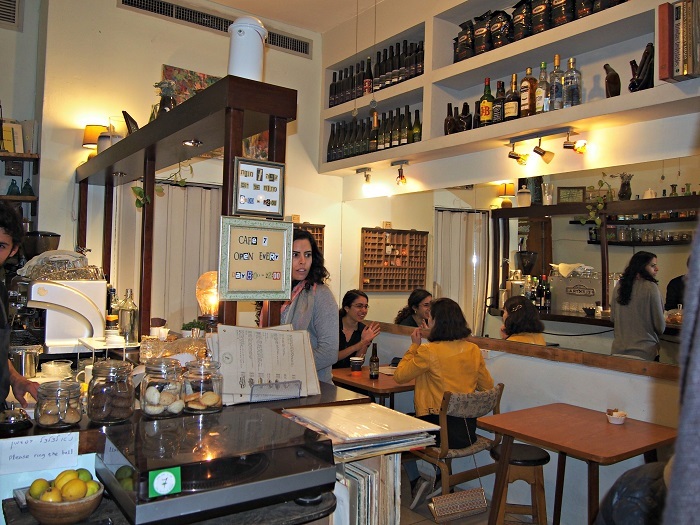 Etz Café is a coffee shop that is operated by a Brazilian association of volunteers. The rule is that only customers who can pay – pay for their meals there, and all the profits are transferred to charity. During Shaon Horef, they serve here chocolate pizzas, kind of small tortillas packed with goodies – chocolate, strawberries, bananas, and whipped cream. Café 7 is a small family coffee shop. There are books and music here and everyone’s welcome to sit for as long as they wish and enjoy the friendly atmosphere. The food is home made, and so is the service! 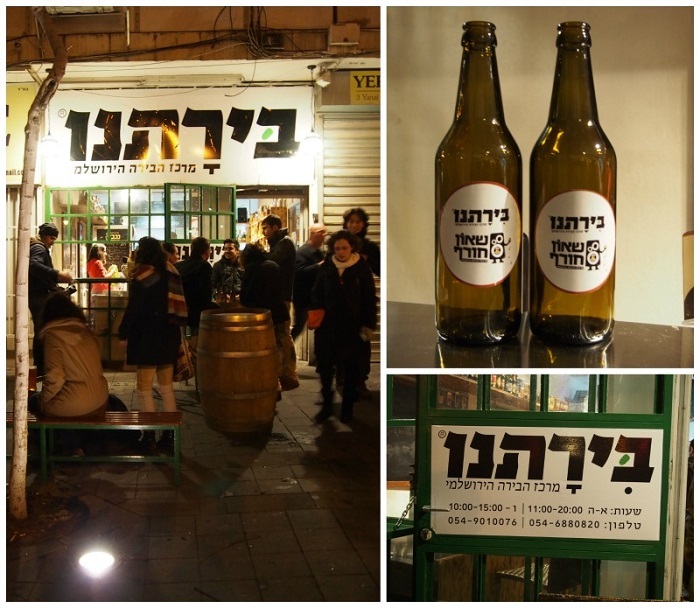 Biratenu (our beer, and also in Hebrew our capital city) is a Jerusalem center of beers. 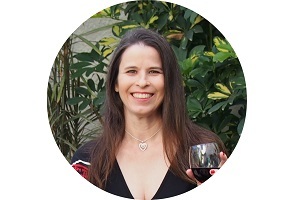 You will find a large selection of Israeli beers, as well as their local beer. 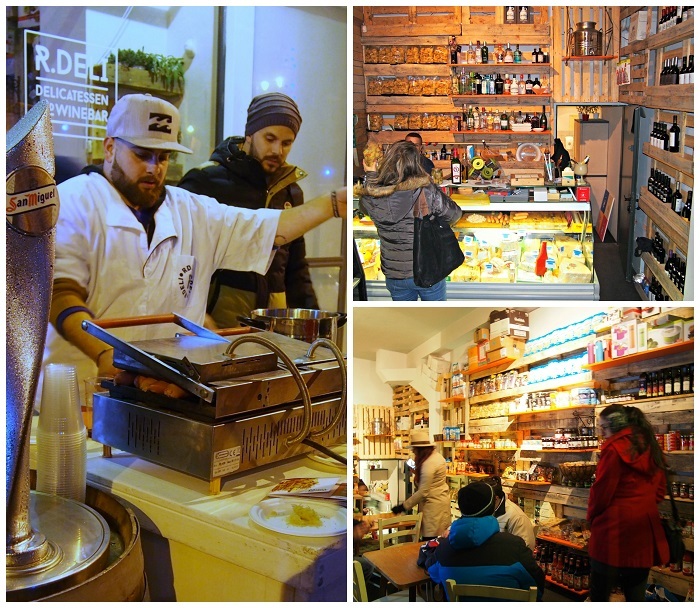 This is the dream spot for beer lovers who want to taste the local flavors of beer! At Yanai Street garage, an arts and crafts fair was opened. The fair includes a seating area with local ‘talk show’ including interviews and actuality. From here we continued to Koresh Street, nearby, where a jazz concert of Divano Swing band took place. It is one of many concerts and shows here, at the end of Shushan street, a concert and shows tent was built, with seating areas. Here are a few photographs of the different settings and shows, as well as the strings orchestra. The streets were packed with people enjoying the festival and the art exhibits on the buildings, on the way, and in the shop windows. 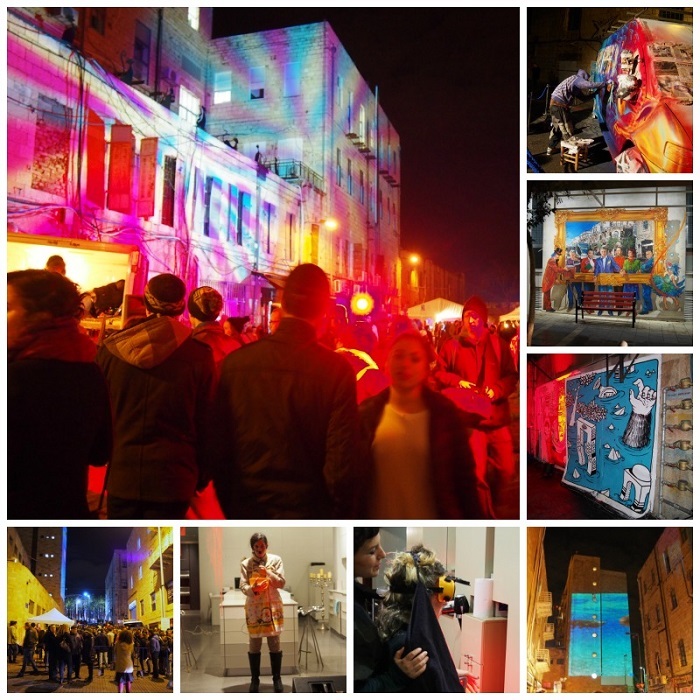 There’s fantastic graffiti on the way, and interactive art exhibits everywhere. Our last stop in the evening was Gatsby bar. 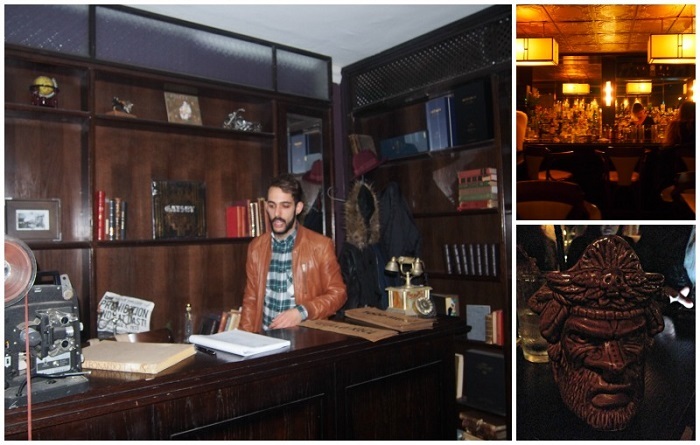 This bar is hiding in a passage near Aroma Café but if you like bars, don’t miss this one! When you enter it, you’ll find yourself in a small ‘library’. It feels like going back in time, the place is magical. A secret door in the library is the way into the bar itself. The place is warmly decorated. The menu looks like an old book and it exposes a large variety of cocktails. The alcohol selection in this bar is fantastic! We tried one of the sweet cocktails, that was served in a unique cup (right bottom of the photo collage below). During the festival they will arrange be cocktail making workshops and demonstration. If you will be in Jerusalem or Israel around this time of the year, take advantage of this lovely event, especially when the weather is warming up surprisingly! For the full schedule: Shaon Horef – winter festival program.